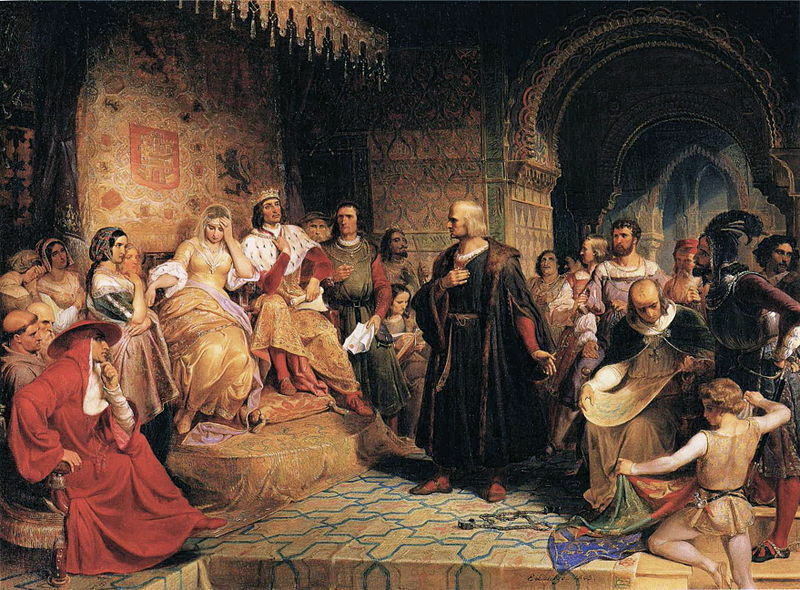 Columbus before the Queen, painting by Emanuel Luetze, courtesy of the Brooklyn Museum, 1843. The Spanish monarchs initially sought to curtail Columbus's slaving exploits in the Caribbean. Just as Castilian concessions in 1479 helped put Isabel on the throne of Castile, similar recognition of Portuguese claims in Africa in 1494 helped to secure Spanish interests in the Americas. As a result, it was Spain, rather than Portugal, that first made extensive use of enslaved Africans as a colonial labor force in the Americas. 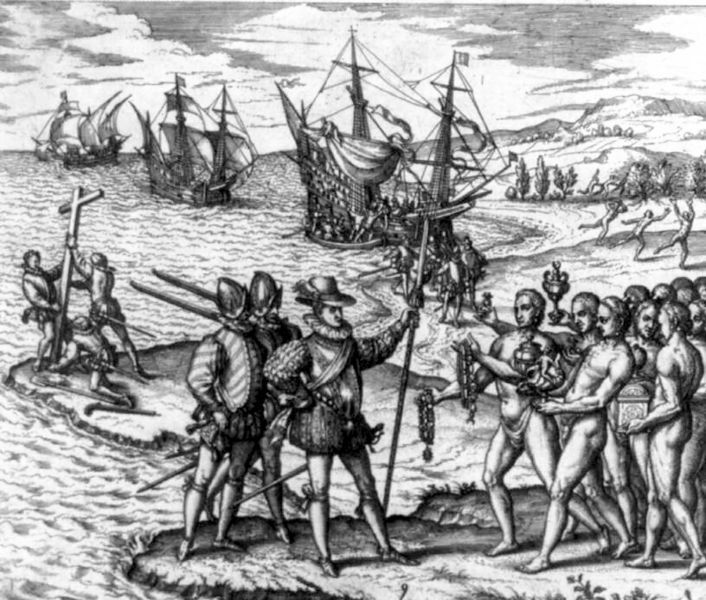 Ferdinand II pointing across Atlantic to where Columbus is landing with three ships amid large group of Indians, ca. 1500, courtesy of the Library of Congress. Soon after his famous 1492 voyage, with the backing of the Spanish Crown and over one thousand Spanish colonists, Genoese merchant Christopher Columbus established the first European colony in the Americas on the island of Hispaniola (present-day Haiti and the Dominican Republic). Columbus is believed to have had prior experience trading in West Africa, and had certainly visited the Canary Islands, where indigenous people known as Guanches had long been enslaved and exported, in small numbers, back to Spain. Though Columbus was primarily interested in finding gold, he also recognized Caribbean islanders’ potential value as slaves. In early 1495, preparing to return to Spain, he loaded his ships with five hundred enslaved Taínos from Hispaniola; only three hundred would survive the voyage. Columbus’s slaving exploits—often viewed as an attempt to compensate for the gold that was not forthcoming—were quickly cut short by the Spanish monarchs, Fernando II of Aragon and Isabel I of Castile. Nevertheless, coerced Amerindian labor grew increasingly important within the Spanish Royal policies regarding Amerindians were in many ways contradictory. The Spanish Crown intended to protect Amerindians from abuse, but at the same time expected them to accept Spanish rule, embrace Catholicism, and conform to a work regimen designed to render Spain’s overseas colonies profitable. Thus in 1501, for example, the monarchs ordered Hispaniola’s governor to return all property stolen from Taínos, and to pay them wages for their labor. Further reforms were outlined in the Laws of Burgos (1512), and later in the Laws of Granada (1526), though both appear to have been largely ignored by Spanish colonists. 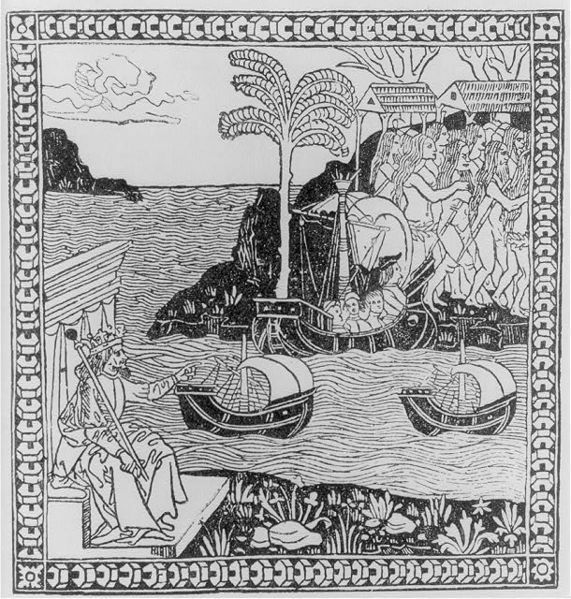 Columbus landing on Hispaniola on 6 December 1492, greeted by Arawaks, engraving by Theodor De Bry, ca. 1594, courtesy of the Library of Congress. Meanwhile, Spain’s monarchs broadly granted colonists dominion over Amerindian subjects, compelling native populations to pay tribute, often in the form of labor. The latter practice was largely an extension of the medieval encomienda, a quasi-feudal system in which Iberian Christians who had performed valuable military service were granted authority to govern people and resources in lands conquered from Iberian Muslims. Also, despite their objection to a trans-Atlantic slave trade of Amerindians, the Crown permitted their outright enslavement and sale within the Americas. 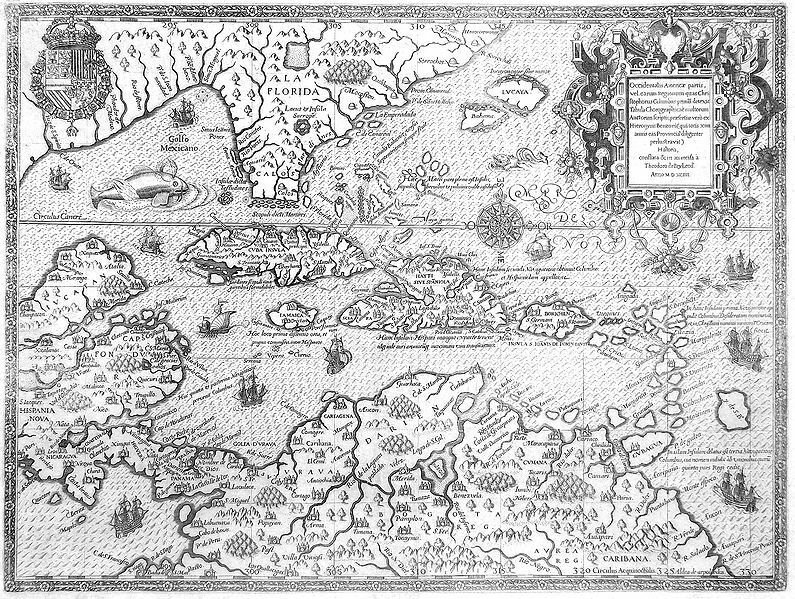 During the first half of the sixteenth century, Spanish colonists conducted raids throughout the Caribbean, bringing captives from Central America, northern South America, and Florida back to Hispaniola and other Spanish settlements. Two of the principal arguments used to justify the enslavement of Amerindians were the concepts of “just war” (i.e. the notion that anyone who refused to accept Christianity, or rebelled against Spanish rule, could be enslaved), and “rescate” or ransom (the idea that Amerindians held captive by other groups could be purchased in order to Christianize them, and to rescue them from captors who were allegedly cannibals). Map of Americas where Spanish settled and often attempted to enslave American Indians, engraving by Theodor de Bry, ca. 1594, courtesy of the Library of Congress. Portrait of Bartolomé de las Casas, ca. 16th century, courtesy of the Archivo General de Indias, Sevilla, Spain. In most of the Caribbean, even before the mid-sixteenth century, it was evident that Spanish colonization based on the mass forced labor of Amerindians was not a viable option. In addition to the demands of Spanish colonists, Old World diseases such as smallpox, measles, chicken pox, and typhus decimated native populations, and reduced workforces to unsustainable levels. 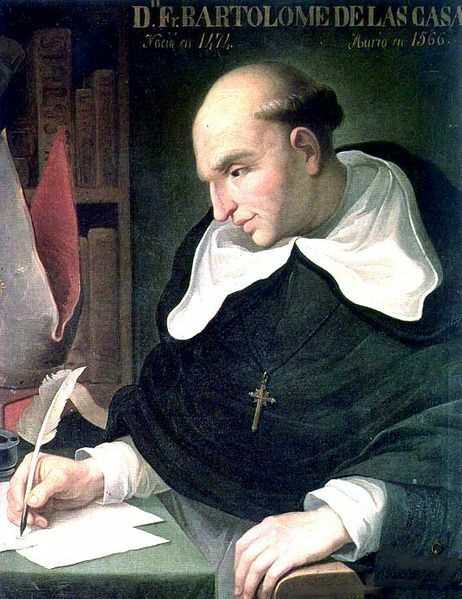 Vocal advocates of reform, most notably Bartolomé de las Casas, persuaded many in Spain that the abuses suffered by Amerindians at the hands of Spanish colonists were unacceptable on moral and religious grounds. Worried by the catastrophic decline of native American populations, and faced with growing opposition to Spanish mistreatment of Amerindians, Emperor Charles V passed a series of laws in the 1540s known collectively as the “New Laws of the Indies for the Good Treatment and Preservation of the Indians,” or just the “New Laws.” Among the first royal decrees issued in 1542 was the abolition of Amerindian slavery. Furthermore, Amerindians were no longer required to work without pay, and Spanish colonists’ children could no longer inherit encomiendas. These changes were met with heavy resistance from colonists in Mexico and Peru, where some colonists possessed vast encomiendas resembling small kingdoms and because of their complaints, some of the New Laws were only partially enforced in these colonies, and some traditional practices were partially reinstated. But in the Spanish Caribbean, Amerindians’ rapidly declining populations led Spanish colonists to look elsewhere for laborers long before the 1540s. With the Portuguese slave trade thriving, they increasingly looked to Africa. 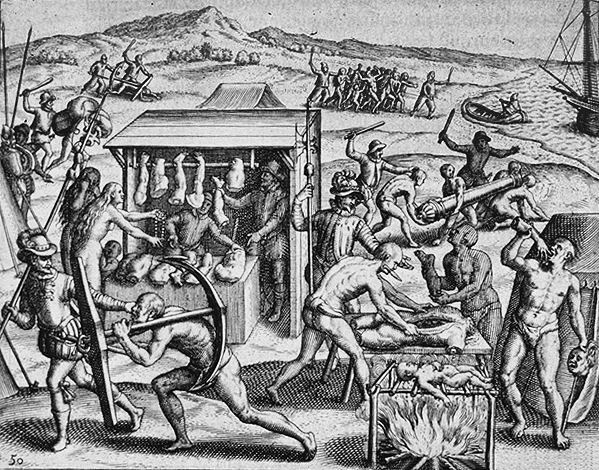 Depiction of Spanish atrocities in the New World, as recounted by Bartolomé de las Casas in Narratio Regionum indicarum per Hispanos Quosdam devastatarum verissima, engraving by Theodor De Bry, 1598.